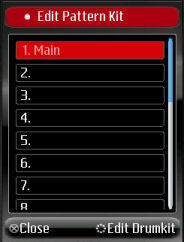 This option allows the instruments used by a pattern to be changed. There are over 40 instruments to choose from. The pattern to change is highlited and Edit Drum kit selected. The screen displays the drum kit's instruments, along with empty slots where new instruments can be added. 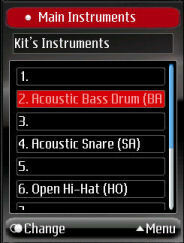 In this example, the Acoustic Bass Drum is highlighted, and Change selected. Here all the available instruments are displayed. 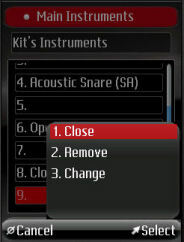 Selecting Cancel returns to the screen which displays the drum kit's instruments, without making any changes. A pattern can only have any one instrument once, it would not make sense to add " Bass Drum 1" twice in a pattern. 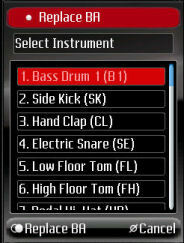 Bass Drum (B1) is highlighted and "Replace BA" is selected. The pattern's drumkit is updated, and the pattern's instruments is displayed. The popup menu also has the option to remove an instrument. When an instrument is removed, it is removed from the pattern, so all steps that have it on, will no longer play the instrument. When all the changes are done, Close is selected to return to the Pattern Options.